This research was initiated during my demography research of cultural medicine in the graduate medical geography and public health programs. Back in 1998 a Pacific Rim study was performed in the Pacific Northwest for uncovering methods for studying the influence of Asian migration patterns on local medical practices. Portland, Oregon had a long history of Pacific Rim influences, especially with regard to Japanese influences and the effects Japanese history had on much of the economic development that took place within Pacific Coastline cities. When the Vietnam War began to take its toll on Vietnamese, Laotian, and Cambodian political history, the Pacific Northwest served as a haven for the political leaders that left Southeast Asia during those years. Due to political and diplomatic relationships that developed between governmental agencies and the ambassadors from each of these countries, a number of communities made their way to the United States between 1976 and 1978, many following the same routes taken by earlier Chinese, Formosan, and Japanese immigrants. Once again, the Pacific Rim states played an important role in providing the support for relocated families during the Vietnam War. About the same time, a formerly Chinese culture known as Hmong, members of which resided in forest community settings in northern Vietnam, were also forced to remove to new locations. Like the others from this region, many came to the United States, a large percentage of which settled down in the Pacific Northwest. During the late 1990s I engaged in a cultural health study of a Laotian church population residing in the Portland, Oregon area. Specific culturally bound syndromes and biological and behavioral syndromes were quite evident in this population, even though it was decades since the Vietnam war had passed. The common psychiatric and psychological problems remained the inability of third and fourth generation descendent members to adjust to the changes in family lifestyle and relationships in the United States. Typically, the children were very well-adjusted, their parents also well adapted, for the most part. Individual in their thirties and forties demonstrated signs that they were undergoing some sort of ongoing psychological or psychiatric related conditions. In the worst cases, schizophrenia of schizoid like affect disorders appeared to be the problem, other times the conditions appear to be more depression related. The most unusual problems were demonstrated by the elders of this group. Many were still living according to their old world teachings. Few spoke any English. Their diet and health-management practices included traditional and American medical practitioners. One of the unusual, although not absent problems noted pertained to SUNDS–Sudden Unexplained Nocturnal Death Syndrome. Many of the elders spoke weekly and regularly at social gatherings about their problems sleeping at night and their experiences with nightmares and night horrors. Some of these bad dreams were emotional and were focused on past home, past neighborhoods and past relationships with their neighbors before the war. In the worst of cases, elders discussed remembering certain parts of the war, and often the same parts over and over again, in the form of a recurring bad dream or nightmare resulting in shouting events and the need for interventions by other family members trying to wake them up. Takot Subo is another disease that mimics SUNDs in this way. Unlike SUNDS, Takot Subo has its own ICD9 identifier. It also expresses itself along another part of the psychological-physiological, or psychosomatic pathway along which SUNDS and a number of other allied physiological and psychological conditions or diseases possibly relate. Takot Subo also clearly demonstrates an age-gender relationship, unlike SUNDs due to the lack of a SUNDS-specific ICD. In general, it is accepted that SUNDS influences men much more than women. In the case of Takot subo, women are influenced more than men, so much, that this gender specific difference is really quite noticeable in population health statistical reviews. The following relationship was noted between Takot subo and another ICD coded for in the psychological ICDs–Factitious Disorders. One common claim was that Takotsubo was psychological in nature, another claimed it to be an example of a cardiomyopathy. The following graphs however depict age-gender relationships between Takot subo and Psychogenic Cardiovascular disorder that suggest it was much more of a psychological disorder than a physiological one. Factitious disorders common to United State elders demonstrated a similar distribution when compared with Takot subo in terms of age and gender. We can break the psychogenic disorders down into subgroups and perhaps be able to separate out those with Takotsubo with other psychogenic cardiac disease states, but this alone does not suffice in explaining the cause for the numerous Takutsubo cases and their very distinct ethnic based distribution. In 1990, Japanese physicians were able to separate this condition into its own disease type, but the biological, physiological and anatomical reasons for its development still had to be better understood. A number of anatomical and physiological studies did little to help further differentiate this disease, other than to state that there was a cardiomyopathy that can result as part of its development. In some ways, the distributions of the different cardiomyopathies in general did have some overlapping age-related behaviors, involving the older aged people more than the younger, but this still did not fully explain the age- and gender-asymmetries that exist. In particular, it is the gender related asymmetry that suggests some sort of cultural basis for this condition has to be happening, making women more susceptible than men. This gender difference becomes even more evident when one determines that the cause of disease in one gender is due to a condition prevailing in the opposite gender–or in this case the death of a male spouse. It is the death of a male spouse that causes Takotsubo to take place in women much more often than any opposing relationship. This in part is due to longevity differences between male and female older age people, but also due to emotional reactions that ensue following a spouse’ death. The body-mind concept common to other forms of medicine serves as one of the better explanations for this disease state. Culturally-based belief systems make it possible for the emotional problems related to spousal death to have an impact on biological states of being and consequently an impact of health, disease and death. In recent years, enough biological, anatomical, physiological and electrophysiological evidence has surfaced to demonstrate the “broke heart” or emotional stress related cause for Takotsubo. “Worrying or crying yourself to death”, or apical balooning of the ventricular walls in Takotsubo cardiomyopathy (ICD9=429.83). The primary theory proposed for this is weakening of the muscle wall due to: a) changes in arterial flow (left anterior descending coronary artery), b) vasospasms of this and/or other coronary arteries, and/or c) microvasculature failure within the cardiac tissue — any or all of these must be accompanied by a period of severe emotional stress resulting in autonomic effects upon the coronary arteries system. http://en.wikipedia.org/wiki/Takotsubo_cardiomyopathy; http://en.wikipedia.org/wiki/File:TakoTsubo_scheme.png. A major problem with some of these theories is that the age distribution of Takotsubo patients is nearly opposite of the the age gender features for traditional cardiomyopathy. So how does the distribution of Takotsubo compare with the demographic history of its related cultural basis? 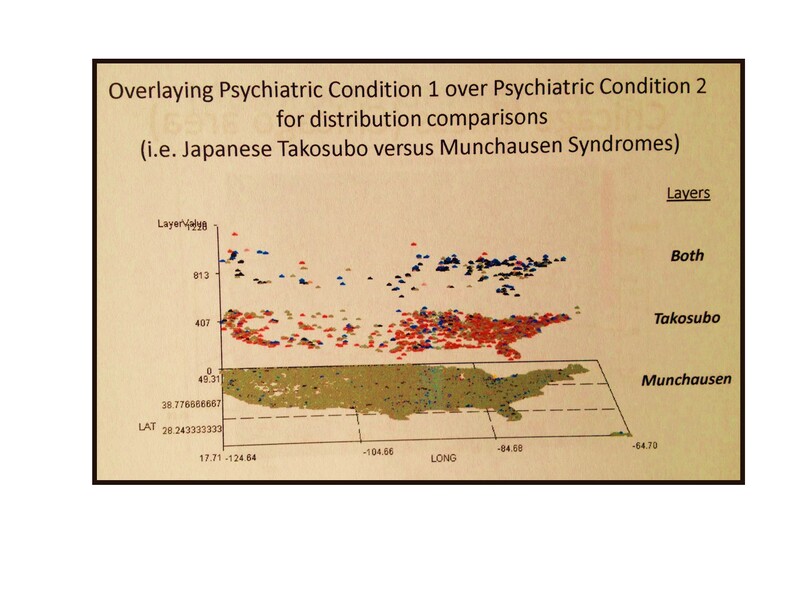 The similarity in age-gender distributions for Takotsubo (ICD9=429.83) and Factitious Disorders (“Munchausen Syndrome”, ICD9=300.16) should raise a red flag in terms of the cause of this pathology. Physicians may have officially considered it a part of the psychosomatic disease profiles often attached to many conditions, even deadly ones, but the age-gender distributions for Takotsubo and the Psychogenic cardiovascular diseases in general (ICD9=306.2) tells us that there is something distinctly different going on with this cardiovascular diagnosis and that some psychological or even psychiatric cause is more appropriate. Like many culturally-based diseases, there are some overlapping features with other culturally-defined pathologies, especially for psychological disorders and psychiatric diseases. The fact that Factitious disorder has a remarkable overlap in age-gender relationships suggests a similar ideology might exist for the two, but with a different physiological consequence in the long run. The cause for factitious disorder related behaviors and consequences probably share some features with the takosubo diagnosis, with the primary differences being some of key underlying perceptions of the horrible events that led up to this diseased state. Mortality rates on a one-year basis are approximately the same, with gender asymmetries even matching to some extent, but the mortality that ensues for Factitious disorder may have different anatomical roots (or routes) than the culturally bound Takotsubo diagnosis. The 1-year age-gender population pyramids tell us these differences and similarities exist. For most American physicians however, their causes still require futher investigation to be better understood. The mapping of this syndrome also tells us something very unique about Takotsubo. 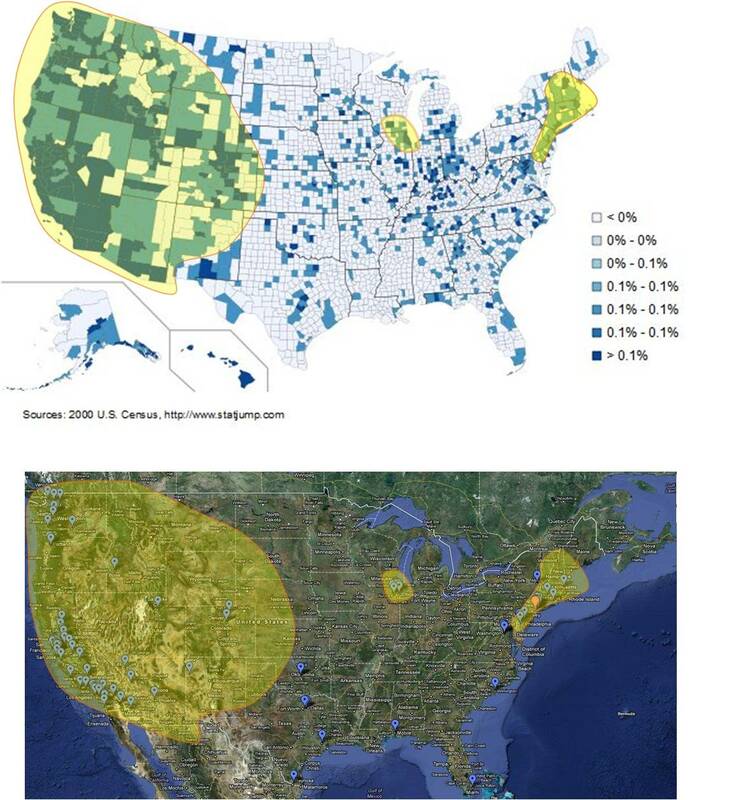 It does demonstrate possible clustering about Japanese-rich multiethnic regions in the U.S., these regions were identified based on a review of Japanese American culture in general (wikipedia) and a review of Japanese food distribution grocery stores in those areas poorly defined by the wikipedia source. A review of the places rich in Japanese inhabitants due to the past history of the local setting with Japanese Concentration camps during the Second World War, and a search for cities with the Japanese equivalent to Chinatown, or Japantown, resulted in a map which could then be related to the Census map on the distribution of Japanese residents. The following results were obtained. Location of Japanese cultural support settings. Source for NY-NJ-CT towns and cities: http://www.justhungry.com/handbook/just-hungry-handbooks/japanese-grocery-store-list/united-states/ny-nj-ct; source for all other locations: Wikipedia, at http://en.wikipedia.org/wiki/Japanese_American. Gardena in Los Angeles’ South Bay area. Pasadena in the Los Angeles’ San Gabriel Valley. Torrance in Los Angeles’ South Bay area. Southern Arizona, part of the “exclusion area” for Japanese internment during World War II along with the Pacific coast states. 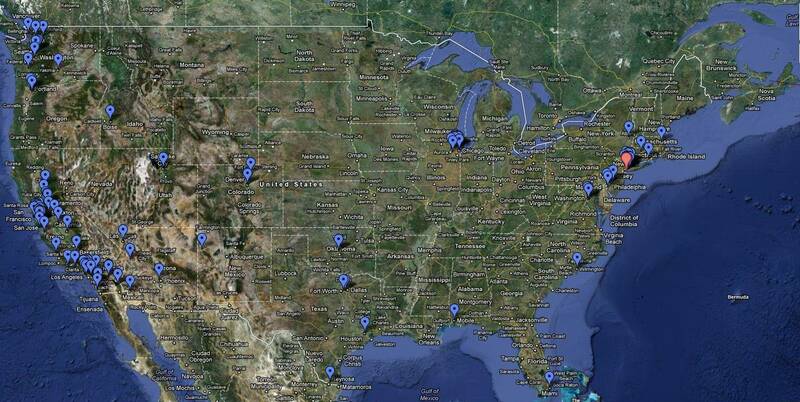 Grand Prairie, Texas and Arlington, Texas (the Dallas-Fort Worth Metroplex area).